Al-Ram, A-Ram, Er Ram or al-Ramm (Arabic: الرّام‎;) is a Palestinian town which lies northeast of Jerusalem, just outside the city's municipal border. The village is part of the built-up urban area of Jerusalem, the Atarot industrial zone and Beit Hanina lie to the west, and Neve Ya'akov borders it on the south. with a built-up area of 3,289 dunums. 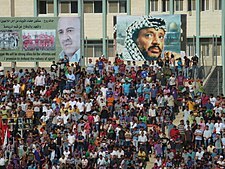 According to the Palestinian Central Bureau of Statistics, a-Ram had a population of 25,595 in 2006. The head of a-Ram village council estimates that 58,000 people live there, more than half of them holding Israeli identity cards. Al-Ram is thought to be the site of the biblical city of Ramah in Benjamin. In Crusader sources, Al-Ram was named Aram, Haram, Rama, Ramatha, Ramitta, or Ramathes. Al-Ram was one of 21 villages given by King Godfrey as a fief to the Church of the Holy Sepulchre. All the inhabitants of the village who were mentioned in Crusader sources between 1152 and 1160 had names which imply they were Christian. The village was mentioned around 1161, when a dispute about a land boundary was settled. In 1517, the village was included in the Ottoman empire with the rest of Palestine, and in the 1596 tax-records it appeared as Rama, located in the Nahiya of Jabal Quds of the Liwa of Al-Quds. The population was 28 households, all Muslim. They paid a fixed tax-rate of 33,3% on agricultural products, including wheat, barley, olive trees and vineyards, in addition to occasional revenues, goats and beehives; a total of 4700 akçe. In 1838 Edward Robinson found the village to be very poor and small, but large stones and scattered columns indicated that it had previously been an important place. In 1870 the French explorer Victor Guérin found the village to have 200 inhabitants, while an Ottoman village list of about the same year showed that Al-Ram had 32 houses and a population of 120, though the population count included men only. In 1883, the Palestine Exploration Fund's Survey of Western Palestine described Er Ram as a "small village in a conspicuous position on the top of a white hill, with olives. It has a well to the south. [..] The houses are of stone, partly built of old material". "West of the village is a good birkeh with a pointed vault; lower down the hill a pillar-shaft broken in two, probably from the church. On the hill are cisterns. Drafted stones are used up in the village walls. At Khan er Ram, by the main road, is a quarry with half-finished blocks still in it, and two cisterns. The Khan appears to be quite modern, and is in ruins. There are extensive quarries on the hill-sides near it." In 1896 the population of Er-Ram was estimated to be about 240 persons. 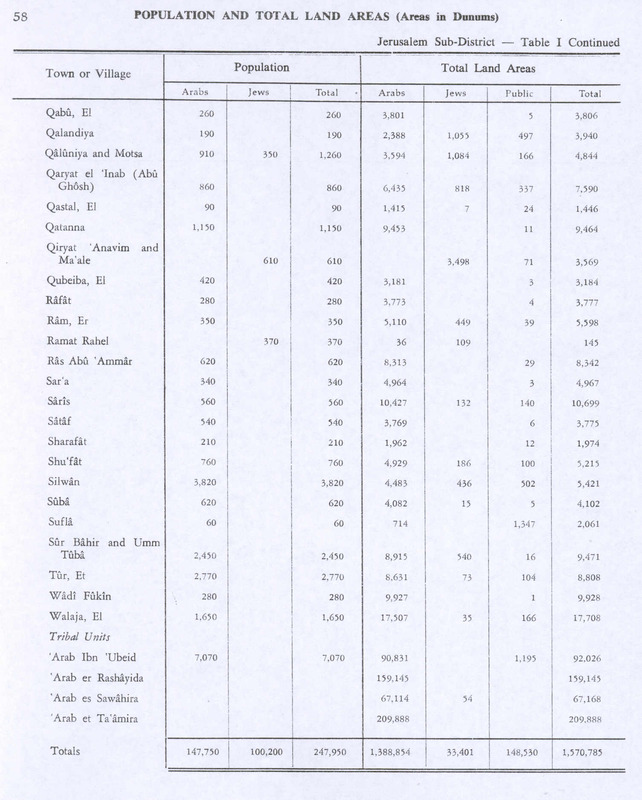 In the 1922 census of Palestine conducted by the British Mandate authorities, Ram had a population 208, all Muslims. This had increased in the 1931 census to 262, still all Muslim, in 51 houses. Al-Ram suffered badly in the 1927 earthquake, with old walls collapsing. 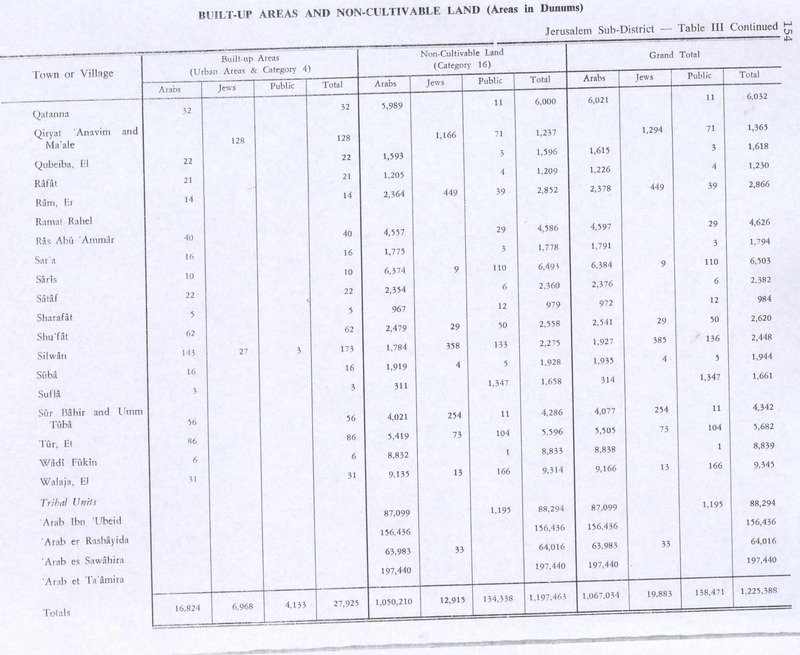 In a survey in 1945, Er Ram had a population of 350, all Muslims, and a total land area of 5,598 dunams. 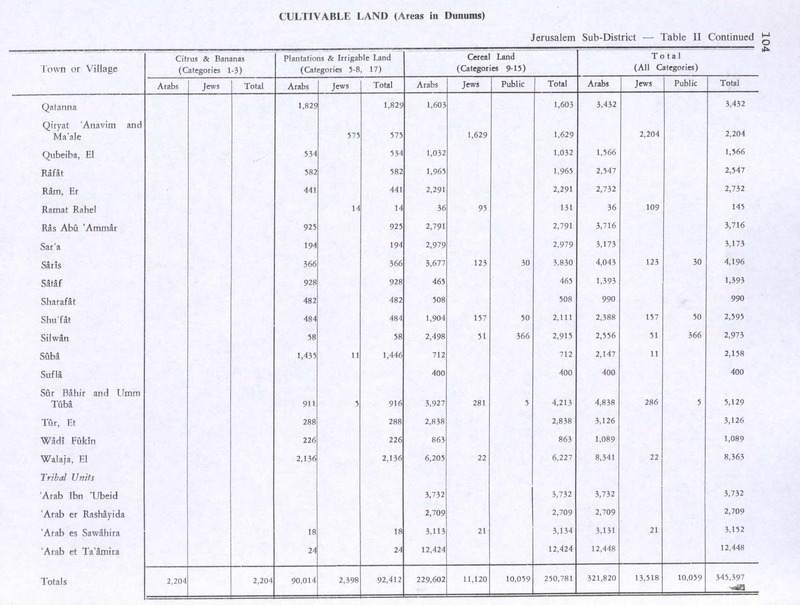 441 dunams were designated for plantations and irrigable land, 2,291 for cereals, while 14 dunams were built-up area. 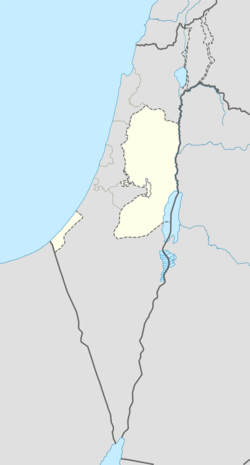 In the wake of the 1948 Arab–Israeli War, and after the 1949 Armistice Agreements, Al-Ram came under Jordanian rule. In 1961, the population of Ram was 769. It was occupied by Israel after the Six-Day War in 1967, and has been under Israeli occupation since then. The population in a 1967 census conducted by the Israeli authorities was 860, 86 of whom originated from the Israeli territory. In 2006, the Israeli High Court rejected three petitions objecting to the construction of a security barrier separating a-Ram from Jerusalem. The route of the fence planned to encircle northern Jerusalem has been revised several times. The latest plan, effectively implemented, called for a "minimalist" route following the municipal boundary at a distance of several hundred meters. This has left the town of A-Ram almost entirely outside of the fence, with the exception of a small part south of the town, called Dahiyat al-Barid. Two structures in the town have been identified. A tower, which was later part of a courtyard building, is of Crusader origin. Designs on lintel of old church. The former (old) mosque of Al-Ram was once a Crusader parish church. In 1838, Robinson noted that "A small mosk with columns seems once to have been a church". In 1870, Guérin described "a mosque, replacing a former Christian church, of which it occupies the choir; the inhabitants venerate there the memory of Shaykh Hasen. The columns of this sanctuary come from the church." In 1883, SWP noted that "west of the village is the Mukam of Sheik Hasein, once a small Christian basilica". It further described it as "The remains of the north aisle 6 feet 8 inches wide, are marked by four columns 2 feet in diameter. The chamber of the saint's tomb occupies part of the nave, and into its north wall the lintel of the old door is built, a stone 10 feet long, half of which is visible, with designs as shown. In the courtyard east of this chamber is an old well of good water and a fine mulberry-tree. In the west wall of the Mukam other stones, with discs in low relief, are built in." ^ "The Separation Barrier surrounding a-Ram". Btselem. January 1, 2014. Retrieved 18 January 2014. ^ "Projected Mid -Year Population for Jerusalem Governorate by Locality 2004- 2006". Palestinian Central Bureau of Statistics. Archived from the original on February 7, 2012. Retrieved January 9, 2015. ^ "Israel's Apartheid Wall Surrounding a-Ram". B'Tselem. Palestine Media Center. June 27, 2005. Archived from the original on September 27, 2011. Retrieved January 9, 2015. ^ Btselem (January 2016). 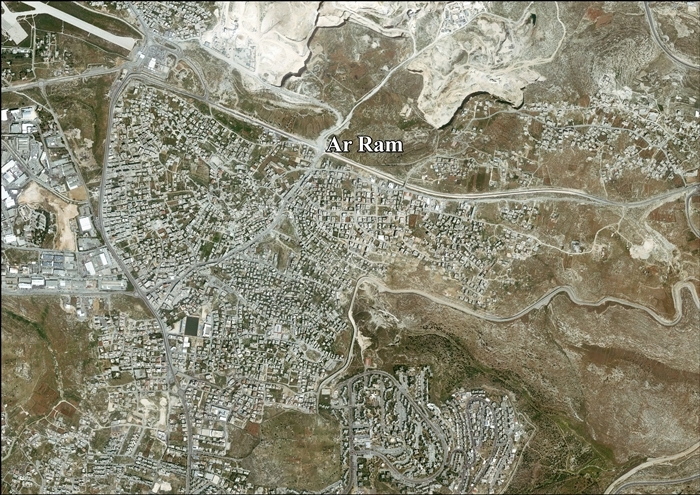 "The Separation Barrier surrounding a-Ram". Retrieved 16 April 2019. ^ Harel, Amos (November 10, 2003). "Separation fence to include wide area east of Jerusalem". Haaretz. Retrieved 18 January 2014. Conder, C.R. (1881). "Lieutenant Conder´s reports". Quarterly statement - Palestine Exploration Fund. 13: 158–208. Pringle, D. (1983). "Two Medieval Villages North of Jerusalem: Archaeological Investigations in Al-Jib and Ar-Ram". Levant. 15: 141–177, pls.xvi–xxiia. Pringle, Denys (1998). The Churches of the Crusader Kingdom of Jerusalem: L-Z (excluding Tyre). II. Cambridge University Press. ISBN 0 521 39037 0. Roziére, de, ed. (1849). Cartulaire de l'église du Saint Sépulchre de Jérusalem: publié d'après les manuscrits du Vatican (in Latin and French). Paris: Imprimerie nationale. Wilson, C.W., ed. (c. 1881). Picturesque Palestine, Sinai and Egypt. 1. New York: D. Appleton. "Another Palestinian Ghetto in East Jerusalem: Israel Closes the Segregation Wall in Al Ram". Applied Research Institute–Jerusalem. 21 March 2005. Archived from the original on 14 August 2007. Oz Rosenberg (11 April 2012). "IDF closes off central Palestinian town to vehicles". Haaretz.